NASA's James Webb Space Telescope began a nearly 100-day cryogenic test in a giant chamber in Texas in mid-July. Components of the Webb have previously endured similar tests to ensure they would function in the cold environment of space. Now all of those components are being tested together in the giant thermal vacuum known as Chamber A at NASA's Johnson Space Center in Houston. "A combination of liquid nitrogen and cold gaseous helium will be used to cool the telescope and science instruments to their operational temperature during high-vacuum operations," said Mark Voyton, manager of testing effort, who works at the NASA Goddard Space Flight Center in Greenbelt, Maryland. Next year, the tennis-court sized sunshield and spacecraft bus will be added to make up the entire observatory. In early 2016, the science instruments completed a series of similar cryogenic testing at NASA Goddard. For months, the components were tested inside the Space Environment Simulator. Then, a "practice model" known as the "Pathfinder" telescope endured similar testing in Chamber A. 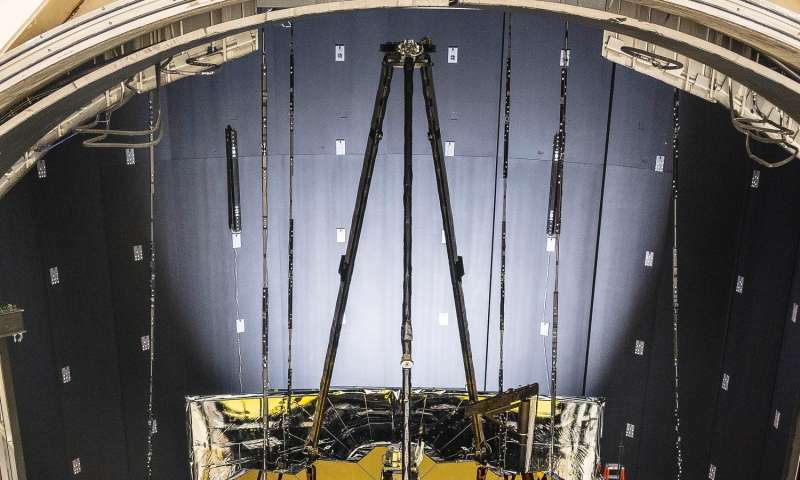 The test confirmed that the real or flight Webb telescope could be done. NASA often rehearses with practice models to ensure all complicated test equipment works and that the precision-test conditions are achievable before subjecting an actual flight article to testing. In early March 2017 at NASA Goddard, Webb's mirrors and instruments successfully concluded vibration and acoustic environmental testing. Those tests ensured Webb can withstand the vibration and noise created during the telescope's launch into space. Currently, engineers are analyzing this data to prepare for a final round of vibration and acoustic testing, once Webb is joined with the spacecraft bus and sunshield next year. In May 2017, Webb journeyed to NASA Johnson, taking Pathfinder's place inside the historic vacuum chamber, Chamber A. How and What Chamber A Will Do? Vacuum pumps remove nearly 100% of the air from the chamber. Temperatures are cooled in Chamber A by coursing liquid nitrogen and cold gaseous helium through plumbing on the shrouds, which act as heat exchangers. That process drops the temperatures in the chamber to simulate conditions in space where the Webb telescope will orbit. "Of course the chamber stays under vacuum and the cryogens are flowed through the shroud plumbing to radiatively cool everything inside the chamber," said Paul Geithner, Webb's deputy project manager - technical of NASA Goddard. The testing is critical because these instruments must operate at around minus 387 Fahrenheit (minus 232.8 degrees Celsius or 40 Kelvin). This is 260 Fahrenheit (126.7 degrees Celsius) colder than any temperature ever recorded on Earth's surface. In Chamber A, the telescope will be cooled down so temperatures are steady and change very little with time, and then warmed up to room temperature or "ambient" conditions. During the testing period, scientists and engineers will monitor the telescope with temperature sensors and cameras in Chamber A. "As far as monitoring goes, there are many thermal sensors that monitor temperatures of the telescope and the support equipment," said Gary Matthews, an engineer on the Webb telescope at Goddard. "We also have some specialized camera systems that allow us to know the physical position of the hardware inside the chamber. That allows us to monitor how the Webb moves as it gets colder. Finally, there is a whole host of optical equipment that we will use to understand the performance of the telescope." What's Next After Chamber A? 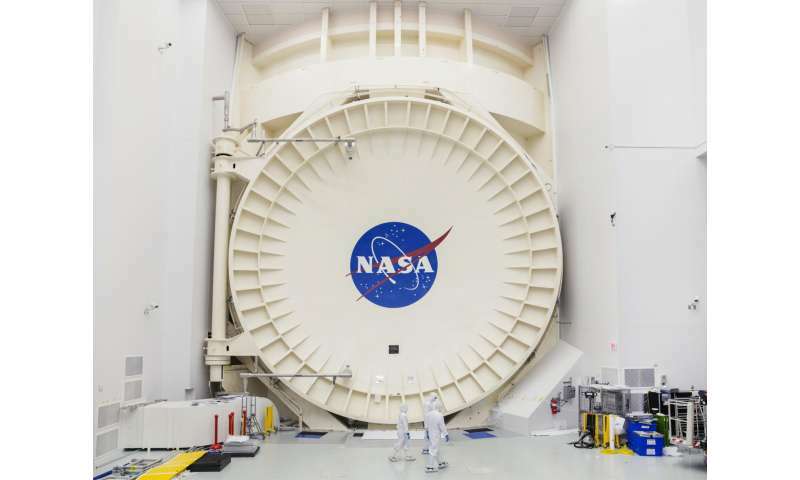 Once the end-to-end cryo-optical testing is complete at NASA Johnson this fall, the telescope will journey to Northrop Grumman in Redondo Beach, California, where it will be integrated with the spacecraft and sunshield, thus forming the James Webb Space Telescope observatory. Once there, it will undergo more tests called "observatory-level testing." This testing is the last exposure to a simulated launch environment before flight and deployment testing on the whole observatory.